Barbara Bush was authentic, honest to a fault, humble and tough but loving, according family members and friends who described the former first lady during a celebration of her life Saturday. Her husband, former President George H.W. Bush, and her son, former president President George W. Bush and his wife Laura, joined two other former presidents and first ladies at the service -- Barack Obama and his wife Michelle, Bill Clinton and his wife Hillary, and first lady Melania Trump. 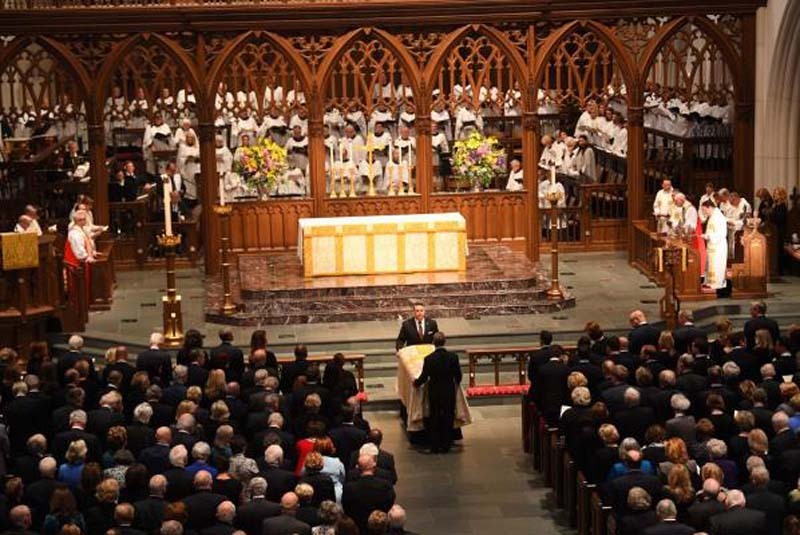 More than 1,500 friends and family members attended the private service at the church, which was the Bushes' place of worship for many years. The service was televised. A eulogy by presidential historian Jon Meacham praised Barbara Bush as "the first lady of the greatest generation." "Mr. Bush raised a family, endured the loss of a daughter to leukemia and kept everyone and everything together," said Meacham. The Bushes "put country above party, the common good above political gain, and service to others above the settling of political scores," the historian said. Meacham told how Barbara Bush's hug of an HIV/AIDS patient "sent a powerful image, one of compassion, of love and of acceptance," and who she believed literacy was the "fundamental civil and human right." During a eulogy by Jeb Bush, he described his mother as a "benevolent dictatorship," and joked, "To be honest, it wasn't always benevolent." Jeb Bush described his mother as someone who deeply loved her family, especially her grandchildren. She was modest and had a joking mannerism at times. Once, when a man walked up to her and said, "You look a lot like Barbara Bush," the man said. Jeb Bush said his mother's response was, "I get that a lot." Jeb Bush said in her final days, when his mother asked about dying, "Without missing a beat, she said, 'I believe in Jesus and he is my savior. I don't want to leave your dad, but I know I will be in a beautiful place." Longtime friend Susan Baker, wife of former secretary of State James A. Baker, talked about Barbara Bush's strength and resiliency. "Barbara, the tough but loving enforcer, was the secret sauce of this extraordinary family," Baker said. "Her friendship didn't stop with people she knew ... Barbara Bush was pen pals with people she had never met. She was the gold standard of what it meant to be a friend, because she was motivated by the desire to show God's love to each and every one of his children that she met." "She believed in and practiced the principles of honesty, tolerance, decency, courage and strength. And perhaps above all, humility. She lived accounting to the mantra of the Bush family for many years: don't get caught up in big me," Levenson said. "Here in Houston, we saw her at major galas, behind home plate at Astros games, praying here in the pews, catching up with a neighbor while pushing her own buggy in Walgreens," he said. After the service, the Bush family motorcade traveled through Houston's Memorial Park en route to the George H.W. Bush Presidential Library Center and Museum in College Station for a private burial. President Donald Trump did not attend the funeral services. A message sent by the White House earlier this week said he would not attend "to avoid disruptions due to added security, and out of respect for the Bush family and friends attending the service." Other presidents also have not attended the funerals of former first ladies. The president said on Twitter that he would watch the service on television.